The kitchen naturally evolves into the central hub of your home. Here, your family and friends gather for meals, of course, but also for conversations, board games, laughs and memories. And if you love farmhouse style, I’ve rounded up a few stone kitchen countertop ideas and things to consider when looking to upgrade hub central. You want your kitchen to be just as beautiful and memorable as the times you spend within it. One way to update the look and feel of your space is to incorporate a new stone surface into your kitchen. Of course, this type of addition not only requires you to research and choose the right material, but also to maintain the look and feel of the stone, too. Think about the family: Bright white options won’t suit everyone. If your kids are into food prep, or if they play with items (like Play-Doh) on the countertop, your pretty white surface may not last long, so choose a more forgiving stone pattern. You’ll also want to consider what you’ll do with your countertops once they’re in place. Most stones are extremely durable, meaning you can use them for cooking prep without worrying about damage to your stone surface. Some are better for particular cooking, too: marble, for example, is great for baking because dough won’t stick to its cooler surface. When in doubt, do some research to see which stone surface is best for you. Consider the differences in price: When it comes to the types of stone you could use for your new countertops, you have so many options. Granite is the most popular option, but you could also try marble, quartz, onyx or soapstone on for size. In considering each type of stone, you’ll also want to look at price.Marble can as little as $60 per square foot, though fancier, imported options might break the bank. A good rule of thumb is to come up with a budget before falling in love with a stone that’s out of your price range. A more popular hue of granite, on the other hand, can be super budget-friendly. Get creative: Even though you want stone surfaces in your kitchen, you don’t necessarily have to limit yourself to a stone-only design scheme. Many kitchens of today have a mixture of surfaces. 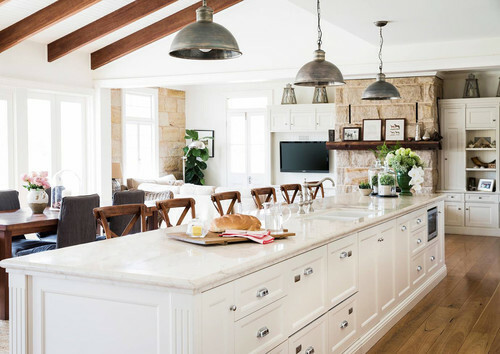 So, you could make the majority of your countertops stone, but incorporate a butcher’s block island for visual interest, as well as added utility. Seal the deal: The best way to maintain your home’s new stone surface is to make sure it is sealed after installation. Most experts will suggest you do so: not only does it give your stone countertop an added shine, but it’ll also make cleanup a breeze. The sealant covers up any porous areas of the stone, preventing stains and other damage. Add a layer of protection: Even though stone surfaces are extra durable, you’ve just made a huge investment in your new countertops. As such, you don’t want to start slicing and dicing and hoping your stone will withstand that sort of pressure. Instead, continue to use a cutting board whenever you’re cutting food with a sharp knife. On top of that, keep your supply of hot pads and trivets to lay an extra level of protection between your stone and high heat. Buy the right cleaning products: You’ve already sealed your countertops, and you take extra care to keep them pristine. Just be sure the cleaning products you use are right for the type of stone you’ve installed. Traditional bleach or big-brand cleaning sprays could damage your new stone because they’re not formulated to clean those types of materials, so do your research. Test sealant once a year: Although you’ve gotten into a good cleaning routine, it’s a good idea to make sure your stone counter’s sealant is still strong. Once a year, perform a test of your sealant with water, oil and lemon juice. If your counter can’t withstand these liquids, a new layer of protection should be added. In most cases, a countertop sealant needs a refresher every three years. With the above tips in mind, you should feel confident in choosing the right stone surface for your kitchen. And, once that’s installed, you’ll be ready to take care of your new investment, too. After that, all you have left to do is enjoy the new look and feel of your kitchen. Because the kitchen is the heart of the home, there’s little doubt you’ll love having such a beautiful backdrop for the meals and memories you’ll continue to make. My name is Kacey Bradely, and I'm a lifestyle and travel blogger at The Drifter Collective. Throughout my life, I have found excitement in the world around me. Having graduated from York College with a degree in Communications, as well as having worked for a lifestyle magazine which has allowed me to travel and become more cultured. I have been been able to further my knowledge and interest for nature, understand the power of exploring other locations, embrace other styles, all while communicating these endeavors through my passion for writing and expression. I hope you are overwhelmed with my love for the world in which I live in through my visually pleasing, culturally embracing and hopefully inspiring posts.